Take Route 287 to exit 57, follow Skyline Drive to Greenwood Lake Turnpike to West Brook Road to Snake Den Road. Follow signs to the New Weis Center. Parking is available at the New Weis Center or along Burnt Meadow Road and Glen Wild Road. The undisturbed forest and rugged terrain of Norvin Green offers sanctuary for birds and other wildlife. Part of the Wyanokie Wilderness Area, the forest is near Wanaque Reservoir and is home to an extensive trail system built from old logging roads. Several trails link up with public and private facilities, including the New Weis Center and reservoir property. 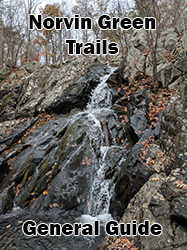 The existing trails, either old forest roads or new trails constructed by volunteers, are perfect for nature walks and other outdoor classroom activities. With hills ranging from 400 to 1,300 feet in elevation, Norvin Green provides the avid hiker with scenic vistas, including the New York skyline, Burnt Meadow Brook and Lake Sonoma. The property is accessible by foot only. A system of marked hiking trails are available for the public to explore. These trails offer visitors opportunities to hike interior woodlands and rocky vistas. There are no multi-use trails available in the park. Please note that the trail difficulty ratings are opinion only. All trail mileages represent only the portion of the trail that passes through Norvin Green State Forest, and complete trail lengths could be longer. To avoid getting lost, a topographical trail map is highly recommended for navigation of the trails. 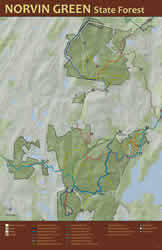 Norvin Green State Forest Trail map. To view this application, you need Acrobat Reader on your computer. Download the newest version FREE at the Adobe site. 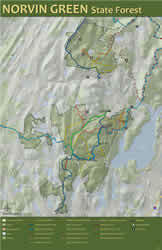 Maps may also be purchased in the New Weis Center or through the New York - New Jersey Trail Conference. Norvin Green includes part of the Highlands Trail, which will run from the Delaware River to the Hudson River when completed. Adjacent to Norvin Green State Forest, this olympic size, stream-fed freshwater pool is a great place for hikers to cool off in the summer. Daily or membership fees apply.